Sunday will see a quick return of hot weather inland and warm temperatures around the bay with the hottest valley temps rising to near 100 degrees. A brief heat spell is expected to blanket most of the Bay Area with warm to sizzling temperatures Sunday. Inland valleys are forecasted to creep above the 100-degree threshold, according to weather officials. Temperatures around the bay are expected to check in around the high 80s in the East Bay to low 90s along the Peninsula and in the South Bay. 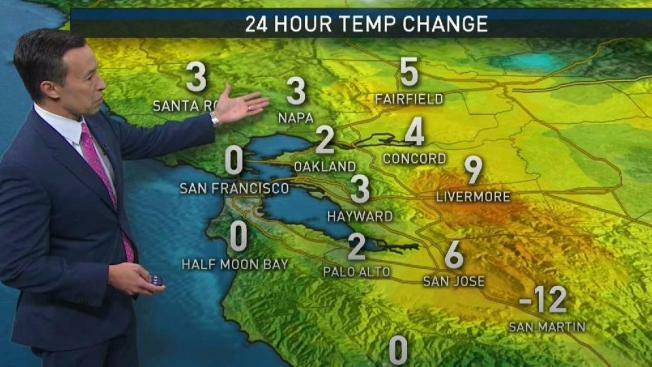 San Francisco is expected to hover around an unusual 85 degrees. For those seeking relief, Half Moon Bay appears to be the coolest spot around. The coastal city is expected to max out around 75 degrees. The sweltering conditions did not prompt any heat advisories or warnings for the Bay Area's nine counties, according to the National Weather Service. The brief spell of hot temperatures comes one week after a lengthy heat wave set temperature records across the region, including an all-time high of 106 degrees in downtown San Francisco. The latest round of heat is expected to dissipate by the start of the workweek, but portions of the Bay Area won't escape unusual weather right away. The South Bay could see isolated shower and thunder chances on Monday and Tuesday, according to the NWS.